‘Salisbury’ is the word banded about by most un-enlightened folk when discussing LSDs for Minis, mistakenly believing the word covers all Mini orientated LSDs. This is grossly incorrect. The ‘Salisbury’ was designed in the ‘50s at a time when racecars were a good deal less sophisticated than today. Tyres were usually cross-ply with severely limited grip due to poor compounds developed ostensibly for rear-wheel-drive cars; the front wheel drive of the Mini being a rarity. And tracks were more than a little ‘bumpy’. Agriculturally built cars needed an LSD designed along similar lines; enter the Salisbury - effectively developed from a tractor diff. High static pre-loads were more than common to help compensate for severe short-falls in chassis, suspension, and tyre design. To all intents and purposes the diff was practically locked up, making the car a real beast to drive. The current Mini market is well catered for in this direction these days. Several designs have evolved, varying greatly in both design and price. Opinions vary as to who’s is the best, however specific design really holds sway, as one type gives superior results in certain conditions over the others. One design flaw a number of them have in common is no or very limited adjustment. The increase in physical input needed to persuade/encourage the car to go in the direction you require has already been stated. The actual amount needed depends on the set up of the LSD and directly affects the overall performance of the car; driver and chassis ability is paramount in coping with these situations. An LSD that’s tunable to the chassis, it’s usage and driver ability an obvious asset. The parameters involved are initial pre-load to instigate operation of the LSD (initial take up), rate of application of torque bias (rate at which it winds up to maximum setting) and variable settings for total percentage of cross-axle torque transfer given (what percentage of engine torque is applied). All this is controlled by friction developed within and between the diffs components. To develop and control friction with finesse over a wide range requires maximum and acutely managed overall component surface area. Following is the current line up of what's available, their design features, mode of operation, pro’s and con’s, area of use and the informed opinions of Bill Gilcrease, long-time GT5 racer, who has used most of them at some time. AP Racing. AP’s ‘Suretrac’ LSD is a relatively recent addition, mainly targeting the road user. The design uses cams and pawls. Consequently, despite AP’s claims that it’s a ‘novel’ and ‘unique’ concept, the design and ‘modus operandi’ is acutely similar to the established Jack Knight pawl-type, just a little more refined. The cams have a series of ‘lumps’ on them (1). The pawls have ‘lobes’ on each end (2), and are positioned horizontally between the cams, carried by fluted internal and external drums (3). When running in a straight line, no movement of the pawls takes place as there’s even traction on both wheels. Once a difference in traction occurs, the pawls slide in the flutes, engaging the cams. The amount of slip allowed is controlled by the frictional force developed between the drum flutes, pawl lobes and cam lumps, the resultant torque bias being applied to the axle with most traction. Pro’s - very ‘gentle’ in operation. Con’s - Comes as a sealed unit with ‘factory’ devised settings, so isn’t user tunable or serviceable. Won’t work with one wheel off ground - result, no drive. Usage - Road, drag racing, circuit racing with well-developed chassis (absolute minimal body roll, and stay off the kerbs), anywhere that won’t experience air-born wheels. Bill says - “Never seen one, but theory says similar experience to Jack Knight diff”. Cost around £485.00 plus VAT. Trannex - 1950’s design with 1990’s engineering and technology. The only real similarity is the ‘plate-type’ design - purely because it gives maximum frictional area, therefore most effective performance. Two cross pins, located in four, curved wall cutouts (ramps), carry four planet wheels (one at each pin end) which engage a pair of sun wheels housed in a two-piece drive drum. 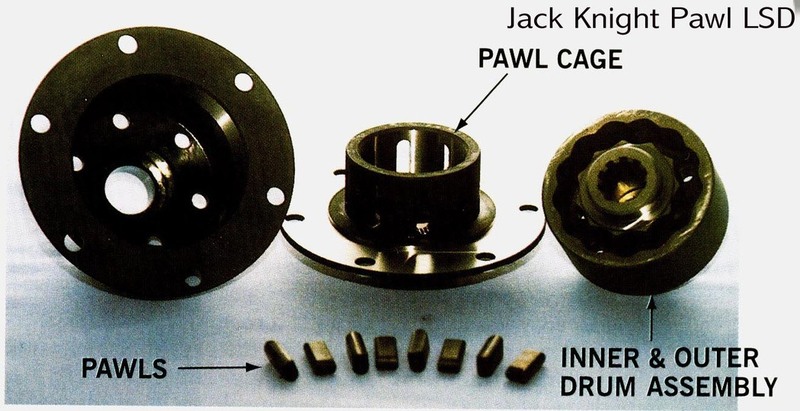 The drive drum halves have a pack of special plates between each end and the outer casing pieces. When a difference in traction occurs, the sun wheels (1) engage the planet wheels (2), turning them and so forcing the pins (3) to move up the ramps (4). The amount of slippage allowed is controlled by the frictional force developed between the plate packs (5) and outer casings (6), the resultant torque bias being applied to the sun wheel connected to the axle with most traction. But that’s not the end of the story. Intelligent and careful design features nett some very desirable attributes. Substantial cross-pins running in isolated drive cases eliminates breakage previously suffered in the Salisbury unit by removing the bending stresses. Their round cross-section and matching curved ramps facilitates changes to the locking action on acceleration and deceleration of the diff. Varying the plate pack configuration alters the percentage of torque bias. Pre-load is set by a disc-spring washer (7).Pro’s - Gives drive even with one wheel off the ground. Multi-adjustable design gives broad spectrum of tuning for development. Alternative ramp angles allow fine tuning of diff action on drive and over-run, affecting turn in and power out characteristics. Pre-load and percentage of drive given is user adjustable. Three basic settings available off the shelf and cheap to develop/alter. User serviceable. Bargain. Cons - further ramp angle adjustments have to be done by manufacture. Needs driver ‘participation’. Usage - Excels everywhere. Harder work than others on the road. Bill says - “A modern day Salisbury. Well made and multi-adjustable. Better than other diffs as it holds the car straight using much less pre-load (wastes less horsepower). Ability to lock/unlock makes corner entry and exit much nicer, and easier on the biceps. Less castor angle’s needed too. It’s a little sensitive to getting on and off the throttle, so don’t be lead-footed. Reminds you smooth is fast! Testimony to this one, and proof it works properly - I broke a CV in one race, but finished the race 25 laps later driving one wheel. A feat not possible on any other diff - period! My current choice. Cost around £404.21 plus VAT. 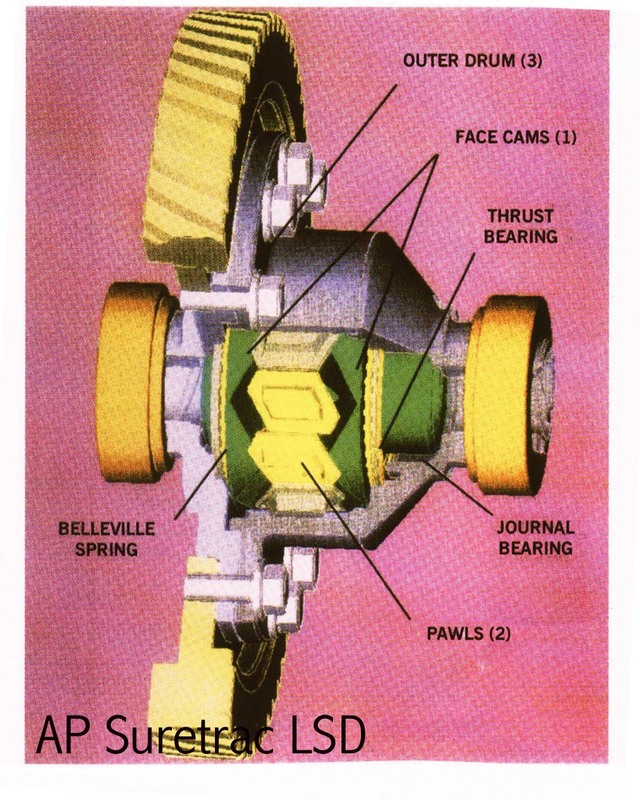 Quaife - this design uses sets of floating helical gear pinions (1) meshing to provide normal speed diff action (green arrows). Disc spring washers (2) pre-load the gear packs. When a difference in traction occurs, torque bias is generated by the axial and radial thrusts (red arrows) of the pinions in their pockets (3). The resultant friction force transmits drive to the other sun wheel (4), and so to the appropriate wheel. It’s progressive in action, but never locks, and needs both wheels in contact with the ground to work. Percentage of torque bias is increased/decreased by varying the helix and pressure angles of the gear teeth. Pro’s - ‘gentle’ in operation. Reputedly hard wearing. Con’s - Limited performance adjustment. Friction caused by gears rubbing on casing, so repairs/servicing likely to be costly. Won’t work with one wheel off ground - result, no drive. Usage - same as AP & Knight diffs. Bill says - “Both Fortech and I used this a few times. We both took it out too! Not confidence building on the track, seeming very inconsistent from turn to turn. Giving a feeling of not holding the car into the corner. Some greater powers say it works OK when new, but when worn - watch out! Like the Knight diff, it free-wheels with a broke CV or axle. Highlights need for ground contact on both wheels to work. Conversations with other folk suggest I ought to give it another try.” Cost - £445.00 plus VAT. The ‘Salisbury’ was left out on purpose - it has no place in a modern performance car. Its archaic design makes it a non-starter in this company. Only generally available second hand, and 90% of those should be scrapped as they’re either bodged, broken, or irreparable. Genuine quality replacement parts are no longer available. Consider carefully what you desire. The wrong choice will have you disappointed, not to mention broke. 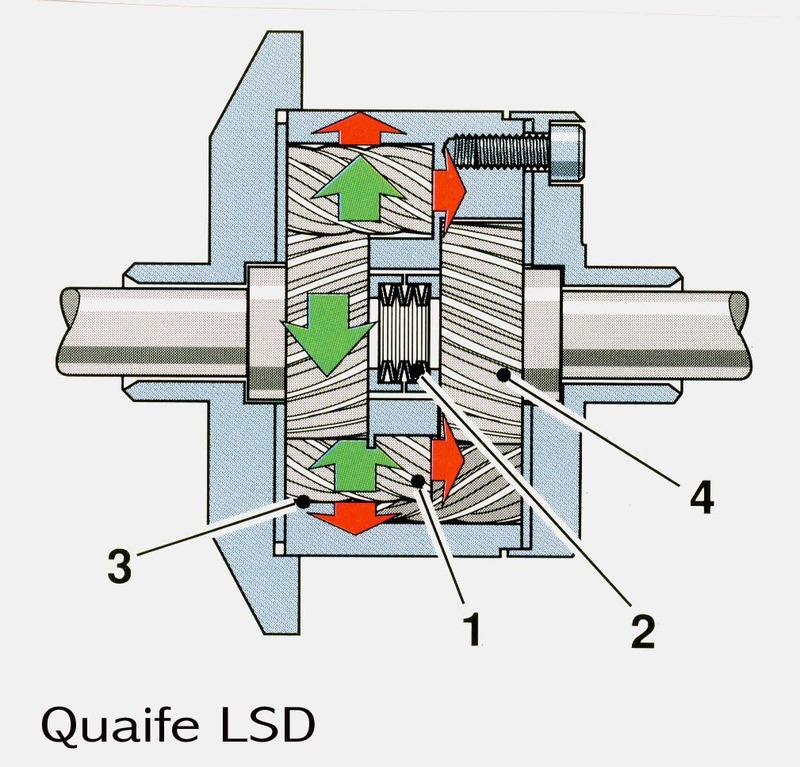 Some LSDs are described as ‘user friendly’ (gentle) - implying they’re not totally effective/efficient at torque biasing - the very parameter an LSD’s fitted to control in the first place. Most of the ‘big boys’ in motorsport abusing front-wheel-drive cars are turning away from gear and viscous type diffs. Plate-type diffs are ‘in’, modern designs judged better able to achieve the level of performance required to match the sophistication and power of their cars, and above all to be competitive. 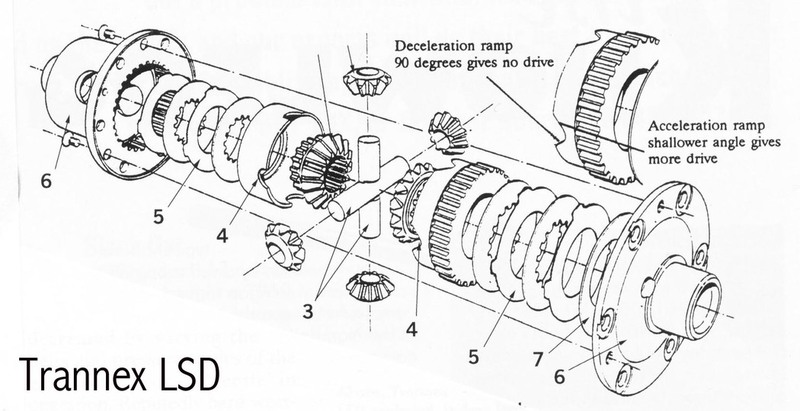 The main aim of fitting an LSD is to get drive in all conditions.